Catholic MPs will be urged to "put God before Gordon" by voting down controversial new laws to create animal-human embryos for medical research. Ulster's nationalist politicians have been invited to meet the leader of the Catholic Church in England and Wales next week, ahead of debate on Human Fertilisation and Embryology Bill. The legislation has triggered a storm of protest because it will lift the ban on animal-human hybrids in order to research diseases such as Parkinson's, Alzheimer's and Motor Neurone Disease. The Catholic Church has also condemned the removal of a doctor's legal duty to consider "the need for a father" when deciding on suitability for fertility treatment. The move - to make it easier for lesbian couples to have IVF - " radically undermines the place of the father in a child's life", Catholics have argued. 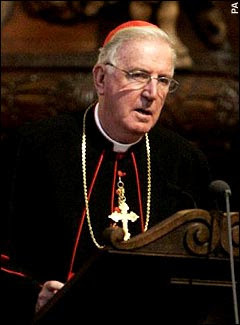 Now Cardinal Cormac Murphy-O'Connor, the Archbishop of Westminster, has invited up to 70 Catholic MPs to discuss the legislation next Wednesday. Sinn Fein's Gerry Adams, Pat Doherty and Martin McGuiness, (who do not take their seats in the Commons) have all been written to along with the SDLP's Mark Durkan, Alasdair McDonnell and Eddie McGrady. A spokeswoman for the SDLP said: "Eddie and Alasdair have not yet decided if they will attend the meeting. "Mark has a prior constituency appointment." The unprecedented lobbying campaign follows Gordon Brown's Government's refusal to bow to Catholic requests to grant Labour MPs a free vote. Both Conservative and Liberal Democrats will enjoy a free vote, but Labour MPs will be expected to vote through a key part of the government's programme. The Cardinal's letter asks for the meeting "given the various interests which are likely to come before the House in the new session of Parliament" . It is seen as signalling a shift towards a more outspoken political role for the Catholic Church, similar to the profile it already enjoys in Scotland. In recent years, the Church has intervened to block restrictions on admissions to church schools and to demand an exemption from laws giving gay couples equal rights to adopt children. However, the lobbying will be condemned by those who argue Catholic MPs must strive to represent all voters, not their own religion. The Bill is also expected to be used by both pro-choice and pro-life MPs to try to change the abortion law, but all MPs will be given a free vote on that aspect. A spokesman for the Catholic communications network said: "Catholic MPs have indeed received an invitation to meet on December 5 and it will be an opportunity for them to raise any issues of concerns. It is not tied to one matter, it could be anything."